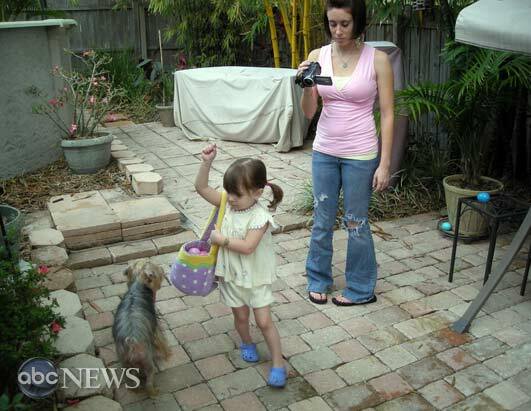 In this never ending circus, there’s now a hearing pencilled in for September 28th – where a judge will decide whether or not a sealed Casey Anthony “jail video” should be released. This soundless video – accor ding to the “Officials” that staged the event inside OC Jail 2008 – shows Casey “doubling over and beginning to hyperventilate” while watching TV news reports relating to the discovery of Caylee’s remains. This same video was sealed two years ago by Stan Strickland, who said at the time it was “too inflammatory” and could affect Casey’s right to a fair trial. I mean – after the hideous animated movie that the prosecution produced and presented (showing a picture of Caylee’s face slowly morphing into a picture of her actual skull, with duct tape conveniently superimposed – AND which they’re now trying to make Casey pay $12,200 for)… PLUS the pictures recently posted on a supposed “Caylee” website featuring the actual autopsy photographs of Caylee’s skeletal remains — do we really need to see Casey’s “reaction” after she was set-up in front of the TV (by the DOC) so she’d see the breaking news of her daughters remains being found? I think not. The prosecution – the faux “Caylee” website – and people wanting to see that video are, in my opinion, nothing more than a bunch of sick twisted bastards. Enough is enough FFS! Have some respect for the memory of Caylee Anthony. In other news – Tony “The Snitch” Lazzaro has decided he’ll not be writing a book after all… Jesse Grund is currently shopping for a book deal (if he can find a publisher)… Dominic Casey now says he WILL be writing a book (if he can find a pen)… and Roy “I Gotta Eat Too” Kronk is trying to make sure he never goes hungry again by suing the National Enquirer for $15,000,000. So it looks like the rumors about “the circus” leaving town were obviously as bogus as the prosecutions’ evidence against Casey. Watch this space… it can only get worse better! I was sealed so it should not be released. What’s the point of it being released? To fuel the Hate. The case is over and done with. She was found Not Guilty. People should just let it go. Why would anyone want to watch it anyway? It’s sick. This is INSANE & has REVENGE written all over it!! WHO can not see this? The ONLY thing I want released & unsealed is all the crooked & illegal crap the sheriffs office & prosecutors did for the past 3 yrs! I’m still trying to figure out HOW they charged her with the LIES when she was not even MIRANDIZED at Universal which is where these lies took place! Thanks for ALL the information you keep putting out. It would be wonderful if someone would investigate and find the friends that are in the photos with Casey. 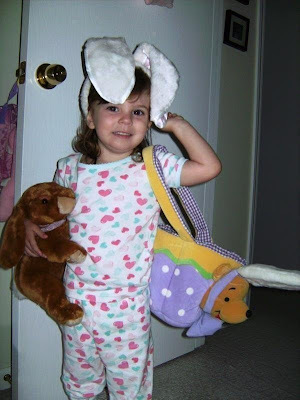 You see, I am left with beautiful memories of a little girl named Caylee who was sleeping soundly on my sofa in my apartment, being babysat, while I was out with her mommy Casey, and her boyfriend. I met some wonderful friends of Casey’s at a house party, then we went to a bar, where we met Lee. Casey introduced him to me and said “he loves me so much, he would die for me”, then she said, he had missed her birthday, so they celebrated it. We snuck out the back so he would not follow us. Photos were taken all this day and into the night. I rode in her car and they must have my DNA somewhere. I also held her camera and the disposable camera when I took or looked at photos. Also looking at the photos what bar was it? The date should be easy to find as well. I do know some of the truth, but I do not know everything. With what I know though, the prosecution was way off, and Casey did not kill Caylee. Thank God, our system works..sometimes. I have been trying to find the people I met, so we can talk again. If anyone wants to investigate this or knows something about this night.. Please get ahold of me. After i found your post some friends and I were intrigued. I looked into your claims to see if there was any way that what you claim could be true and it appears it could be. I have located the information about that night & the parties who were present. It all leads back to OVIEDO. The night in question would have been July 3 2008, when Lee came looking for Casey & she snuck out the back . I have made a list of the people listed as being present with Casey at that location. I have also listed over 100 texts & calls made or recieved by Casey from or to Cindy or Anthony Home. For someone to have been avoiding her parents she sure called/texted a lot! I would like more information about this night/event and what you know about it. Cindy to Universal Studios to see if she could find Caylee because Casey said somebody named Jennifer Rosa was babysitting Caylee at Universal all week. 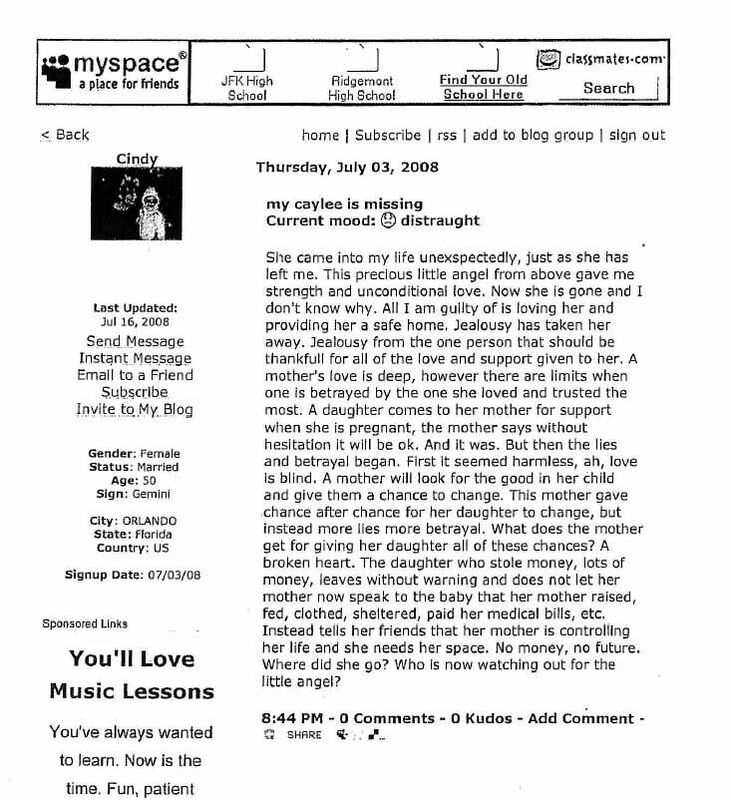 Lee Anthony sent Annie message on MySpace that Caylee was missing. Annie texted Casey and she told Annie that Lee was crazy, that Caylee isn’t missing. Lee Anthony said his mother, Cindy called him July 3rd est 8:00pm, told him Casey and Caylee had not been home for longer than two weeks. Casey found out Lee was on the way to “The Dragon Room” she left. Brian Lufkin, Mallory Parker told Michelle that Casey said she did not want to see Lee. Casey, Troy Brown, Melissa England to “The Lodge,” 49 N. Orange, Orlando. Casey upset when Lee called her that he was coming to get her and Casey wanted to leave. This page lists 52 calls or text messages between Casey & Lee Anthony or Mallory. Troy Brown INTERVIEW 07/25/2008 Pg13, line 18): The 3rd Troy had to go to work and Melissa and Casey spent like five hours together and NO MENTION OF CAYLEE, and Melissa thought that odd because she was in a prior relationship with a man that had a baby and so she was almost looking forward to that conversation. (Troy Brown INTERVIEW 07/25/2008 Pg14, line 14): That night Troy, Casey and Melissa all went to The Lodge down off of Orange Avenue but NO AMY. Casey got upset because her brother called her. (Troy Brown INTERVIEW 07/25/2008 Pg15, line 3): TB: Uhm, we, I don’t, I, I didn’t know what the content of the calls were. But she was visibly upset and said that her brother was coming to get her and she just wanted to get out of here. And then we uhm, we left after that. Casey text messaged Jesse that if her parents call him for him to just “Stay out of it” then left voice mail, “Something going on. If my family tries to call you don’t say anything to them”. friend of Casey- text messages – met Casey through Lauren Coppel – he was Amy’s roommate at a house in Oviedo, FL prior to June 2008.
saw Casey with Caylee June 12, 2008 at Lake Underhill Park – talked to Casey on phone, in jail -added Nov 17, 2008 to STATE Witness List. Troy Brown, He met Casey on 6/5/07 through a friend [Lauren Coppel]. Amy’s former roommate at a house in Oviedo, FL prior to 6/7/08. In the call, Anthony speaks to her mother, her brother and her friend Kristina Chester. She was asking her brother to give her the phone number of her then-boyfriend, Tony Lazzaro. On the call, a tearful Chester tries to get answers out of Anthony regarding Caylee’s whereabouts. The child had last been seen June 16, a month earlier. Why does all of it seem to circle back to Lauren Coppel? Where is your “couch”? Who babysat her that night at YOUR HOUSE? 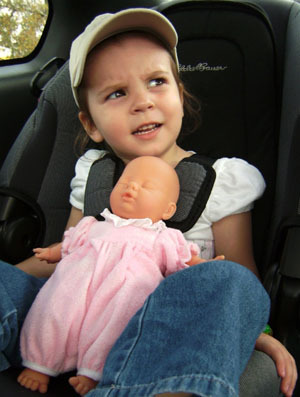 Did you see Caylee leave with Casey on July 4 2008? The Anthony Cement Slab built was on July 3-4 weekend. Here is a list of items purchased to pour a cement slab even though it was raining all weekend. There were pavers and weed barrier found with the skeletal remains. Some of the same items used to construct something on the Anthony home property. Something constructed on a whim or on impulse and build when weather conditions should have precluded that timeframe. The K. Ballman post has piqued my interest since my initial visit to this site. Again, I thank you for your time and attention to information which may be pertinent. Ms. Ballman also indicates, in her original post, that photo number 19, as posted at this website, under Casey and Caylee’s Pics, was taken after June 16th, and infers that those familiar with the Orlando area should be able to identify where that photo was taken. Is there anyone else out there who may be able to identify where this photo was taken and when? Does anyone know other re. to this post or author? Well, while you might be right on, for some of this.. The dates do not fit the truth. Look into the date that Lee said he went looking for his sister to find Caylee. On this date.. Caylee was alive and happy, and as cute as can be. She went to sleep on my sofa, in the apartment we were staying in, she was being babysat, while we went out this night. We went to a house party, there are in photos from Caseys camera, and then we went to the bar, where we used a disposable camera, and met Lee, celebrated Casey’s birthday, since he had missed it, and snuck out the back so he could not follow us. The truth is in the photos on the Internet everywhere. You even have one photo that my little son took on your site. It is the photo with Casey and Caylee carrying my sons Eagles football, with his small fabric orange with black lines basketball in the grass. If you look into these photos and find the places that they were taken, and look for the friends, you will find me. I do not know ALL the truth..like I said..but I do know that Casey did not kill Caylee and that she was alive and not drowned in a pool and she was not missing. What happened after the night at the bar.. Well Caylee went with her mother and her boyfriend back to their apartment. I too am intrigued by Kimberly’s posts. I did also notice that she is friends with our host, caseyanthonyisinnocent on FB. She appears to post messages directly to Casey. I have not as yet contacted her through FB but I plan to do so ASAP. Also the initials she used seem to match for a particular person but we are not 100% sure. SO Rico had the photo of Caylee wearing the pink shirt at his apartment & the photos of her wearing that shirt at the Oviedo house. I guess we know who took the picture. 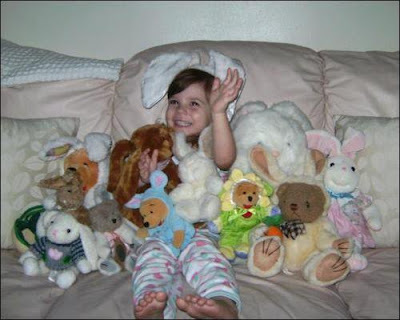 http://caseyanthonyisinnocent.com/wp-content/uploads/2011/07/Casey-Anthony-Caylee-Anthony-26.jpg This is the picture Kimberly mentioned. If you look at it you can see that Caylee is CLEARLY taller then she had been in APRIL 2008. If so, how could it possibly be that these photos were taken in Jan 2008? I had previously used the photo Kimberly mentioned (football) to show that Caylee was tall eonough to open doors both interior & exterior. Using the averages of normal leg length ratio I was able to determine that Caylee’s heigth at the time of that photo was 36+ inches. That almost perfectly matches the heigth derived by the autopsy report. Unless Caylee experience 0 growth from Jan – June the Oviedo photos were taken nearer to summer. 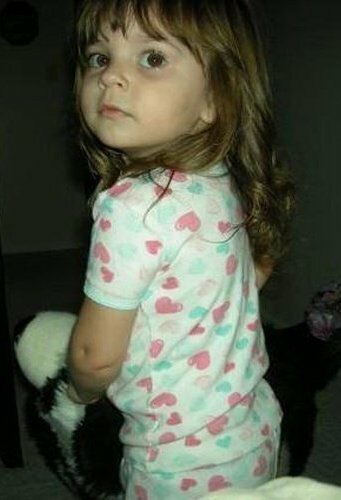 http://www.cfnews13.com/static/articles/images/2010/casey-anthony-caylee-evidence-0921-1.jpg This photo was taken in late Jan or early Feb when Caylee struck her face on the corner of a table. Rico witnessed this event. http://3.bp.blogspot.com/_kl5slzN2nmY/SUwYReNbhHI/AAAAAAAAAig/2NvhECFlhfo/s400/caylee11.jpg (Caylee last Easter, as tall as the door knob (approx 34 inches). http://2.bp.blogspot.com/-fqzCZZMn0po/ThEKioLGBzI/AAAAAAAAA2c/IHC2qZSpWMs/s400/229111_212103298810696_211697718851254_703291_6462344_n.jpg (Taken at Easter 2008 – Compare with above picture as both taken same day with Caylee wearing the same pajamas. I would see that video as a young woman who was in great sorrow, emotional pain & distress if they did release it. But of course there are some who won’t, & I’m sure you are aware of that. The thing is everyone has a free will to choose what they will believe & what they won’t & there is not a doggone thing we can do about it. The only person we actually can control is ourselves. So prove them wrong, by showing them. How you do that is be the very best you can be. Casey should follow the path in life that her feet have been set on, see it through, be the best doggone whatever (insert career path here) she can be, help others if she feels inclined. Try not to let her heart get bitter. By focusing on what people think, whether they like her or not or approve of her or not that is a sure way to become bitter. She should try her best not to let that happen. She should grieve, she is allowed that, she should cry when she feels like it & smile when she feels like it. She should feel her hurt & pain, face it head on, & allow herself to heal. Sure some will never let a person forget their past even if they DO change, but the truth of the matter is, we were born alone & we will die alone & when all is said and done their opinions don’t matter very much. Casey has great promise to do something great in this world & I am sure if she allows herself to stop focusing on mankind who is not without errors in their lives, she will move past all of this. Time stops for no one, this too shall pass. Not to dampen anyone’s spirit, but Casey should never let her guard down, she should not trust so easily if someone says they are a friend & mean her no harm, she should always test people to see if they are sincere & mean what they say. See if they have integrity, and test them for a while before letting her guard down, because sadly there are some who may lay in wait for a long time to try to do some kind of damage, be it emotional, physical or mental. Don’t let that happen. Be wise! First of all, I don’t want you to misunderstand me, they definitely should keep the video sealed. However, there are several explainations to why she was “hyperventilating.” First of all, she was probably just upset about the whole thing about her daughter being dead, and the news report brought the whole thing back. It’s an audioless video so she could have been crying about her daughter’s death. Most people hyperventalate when they cry, don’t forget. Secondly, I’m sure she was told that she couldn’t be wrongly convicted if no body was found. Now that Caylee’s body was found, she could have been nervous knowing the fact that the courts would be able to wrongly convict her more easily. And, also, Jon, I agree with your point that there is no reason to release these tapes. Would they release the tapes if Casey weren’t famous? No. It is technically unconstitutional for a legal system to single out people like this, especially people who have been acquitted. Let’s not forget, I know some lawyers, and they (the good ones) said the Casey Anthony trial would have been dismissed long ago if it were not so widely covered by the media. Casey video should be sealed not revealed to public the Florida Justice system is so bad like their out for revenge themsleves. Video shows her in traumatic moment upset hyperventilating and shaking because he daughter was found its a reaction from her sadness. Hang in their Casey and persevere. Be around people you can trust and get your life back together spiritually & emotionally. The hair length is odd…Didn’t Cindy, at an early stage, ask Casey if she had cut Caylee’s hair recently?